The bubble is an extended tooltip (title HTML attribute). It allows to display a box with additional information. Set EventHoverHandling to "Disabled" (the default "Bubble value would activate the bubble on hover). Assign your DayPilotBubble control id to BubbleID property. Set DayPilotBubble.HideAfter property to "0" (this will prevent automatic bubble hiding on mouseout). 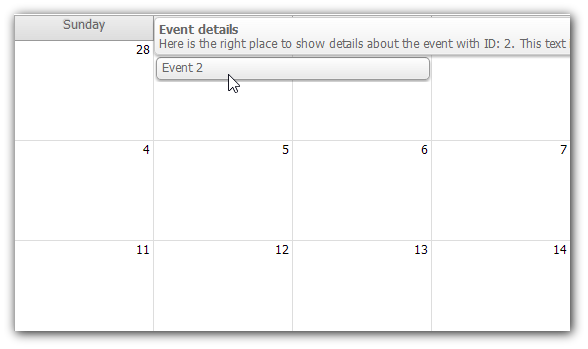 By default, events will display a tooltip (using a title HTML attribute) with the event text as content. You can disable it using ShowTooltip property. Static bubble HTML can be defined using e.BubbleHtml in BeforeEventRender event handler. It's possible to specify the Bubble HTML content statically in BeforeEventRender event (and prevent dynamic AJAX call on popup). See also event customization. If there is no static bubble HTML defined the bubble control will ask for it using RenderEventBubble event of the DayPilotBubble object. The bubble object must be declared before it is used (Html.DayPilotBubble helper must be above the Html.DayPilotMonth helper). If no static bubble HTML is specified, OnEventBubble event will be invoked (on DayPilotMonth object). Define bubbleHtml in the event data object. Provide the HTML in the onLoad event handler of DayPilot.Bubble object.